With the coming of the Romans brought a new, massive opportunity for trade was opened up and a vast expansion in the goods and services that were traded, both within Britain and also accross the channel and witht he rest of Europe. By the time the Romans invaded in 43AD, Britain already had a thriving economic trade with the continent and the arrival of the Romans made this increase. By the first century AD., Britain had a reputation for producing fine quality products. The woollen garments exported far afield were considered the best available, and it was the height of fashion to have a garment made in Britain. Livestock, especially hunting dogs and basketry were also exported in great quantities, along with minerals excavated from the mines. Little is known about British produce before the Romans, as the island generally traded in commodities that have long since perished. 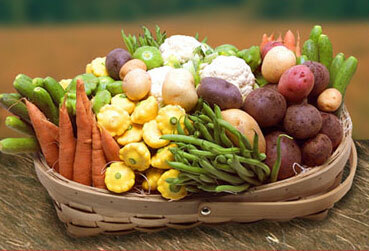 As far as imported goods go, Britain imported mainly fruit and vegetables from Gaul. But the imports were not only goods. People too, came to Britain and settled. 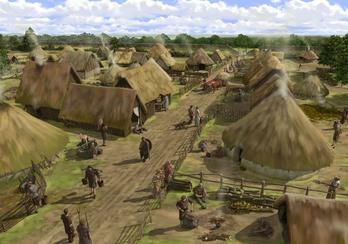 The Atrebates, Druid, and Parisi tribes all began in Europe and emigrated to Britain over the years. Of these only the Atrebates retained a presence onboth sides of the channel. All was not rosey though as there were fundamental drawbacks that prevented Britain from trading a wider variety of goods. The first of these was the lack of an effective road system. Travel in Britain was had to be made either on foot, or with the aid of a horse. The road network consisted of a series of rough tracks from settlement to settlement, with no proper order or structure. To travel around the country, you just set off in the general direction until you eventually reached your destination. Even if the knowledge to build a road system in Britain had existed, there was one other obstacle. The country did not have a central administrative capital, as it consisted of a series of tribes, each with their own designated area. To build a road network would have meant co-operation between the tribes, an agreement on routes and overall costs. Since the tribes were always on guard against incursions by neighbouring tribes, the general mistrust alone would have prevented such a scheme. The second hindrance to trade was that the tribes in Britain all had their own unique currencies which were minted, by hand, in their own territories. At least some of the tribes had their own currency, whereas others, deeper inland, did not even have any currency at all and relied on bartering for goods as their method of trade. As Roman money was not yet legal tender in Britain, and the European countries would not accept individual tribe's currencies, this was one of the biggest barriers to effective cross-channel trade. On the continent, the Roman Empire with it's single currency was spreading and occupied countries all adopted the Roman monetary system as their standard. So trade for goods and services was easier within Europe than Britain. Trade between Britain and Europe was good, but frustrating as the British insisted on trading goods for goods, rather than goods for money. Still, this was the accepted method of trade within Britain and it seemed to work for them. The first change was the introduction of the Roman currency and system of money, which was universal in the Empire. Under this system buying and selling goods could be done in hard cash which could be used anywhere the Roman influence existed. 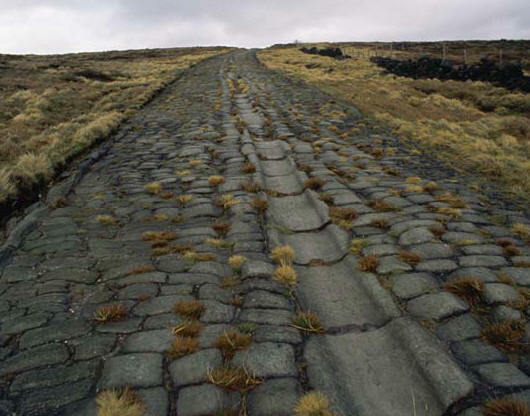 Then came the famous Roman road network; in place of mud tracks came the long, straight, direct links between the fast growing centres of commerce. Goods could be transported in far less time. Roman engineers taught the British how to build bigger and stronger ships to take their cargoes to newer and further markets. The new technology enabled bigger carts to be made, thus increasing the quantity of goods transported. 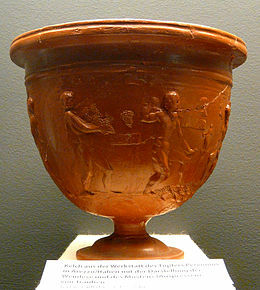 The variety of goods exchanged became greater with the introduction in all countries of foods that would have decayed during transport before the Roman "improvements." New fruits, such a figs, arrived in Britain. In the late first and early second centuries, it is recorded that British oysters appeared on Roman tables and were considered very much a delicacy. Under the Roman influence, the standard of industry rose considerably. British pottery was somewhat bland by comparison to the European manufacturers. When you consider the quality and intricacy of Samian pottery, it is obvious that the British pottery industry had to undergo a revolution if it was to survive in the new market. 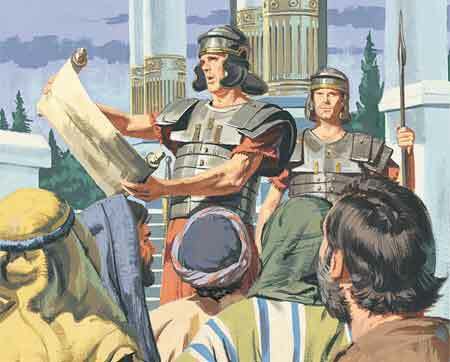 The quantity of minerals mined, notably lead, increased under the Romans. Britain was rich in base metals that were needed for the military's use and the minting of silver coins. Eventually the exports to Rome of minerals was at such a level that the Spanish, who had previously been the main supplier, complained about the damage the British were having on their economy. The entrepreneur existed in Roman times in many forms. Where a need arose, there was always someone who knew how to make a business The most common type of industry that expanded under the Romans was the service sector. As the road network grew, so did the services that supplied the needs of the traveller. At major junctions and along the roadside inns with stables were built. Even though the roads meant speedier travel, it still took days to travel across the countryside. The need for resting places became apparent and they soon appeared. Here, the wayfarer could leave his horse in the stable, where it would be fed and watered. He would then spend an evening in the inn, before retiring to his room and be refreshed for the onward journey. While stopping over, the local blacksmith could inspect his mount and carry out any re-shoeing that was necessary. Traders would sell goods that could be sold at market. Consequently, new towns emerged and grew into major trading centres. Many of these new towns still exist today. Although the actual buildings have long since disappeared, the present villages occupy the original sites. Braughing in Hertfordshire, 20 miles (14km) north of London, was built on the crossroads of Ermine Street and Stane Street. Still further north along Ermine Street, at Godmancester there was a Roman fort, an inn, a bath house, some timber houses and businesses and a market place. The economy some 2000 years ago had many similarities to the present day style of economic control. Taxes and inflation were well known in Roman times, as reflected in records of the period. 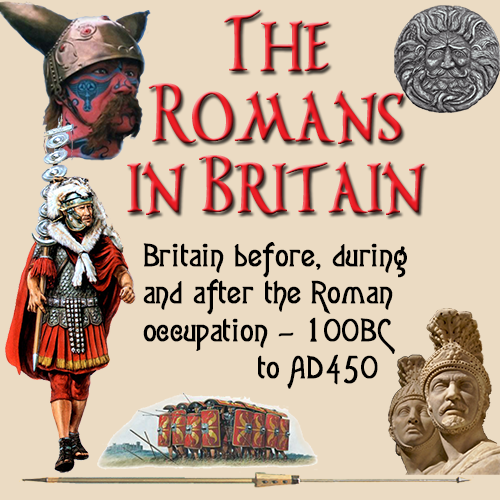 Imports into Britain were subject to a 2½% duty and goods sold outside the Roman Empire, e.g. to the natives in Scotland, were landed with a levy of 25%. Even so this did not seems to effect the level of exports, as many British goods were prized and much sought after. In 301AD, Emperor Diocletian became concerned at the level of price increases that was having a negative effect on the economy throughout the empire. So he issued an edict that fixed the maximum prices of goods, services and incomes. The inflation of the period must have been excessive as many of the prices, for example British woollen cloaks, had their prices fixed by an act of law.